Assorted NASA space food samples, including freeze-dried and thermally-stabilized dishes, drinks and desserts. NASA is now offering museums a choice of freeze-dried and heat-resistant artifacts for their space shuttle-themed displays. The space agency on Tuesday (Sept. 4) expanded its offer of surplus space food and space shuttle heat shield tiles, which had earlier been open only to educational organizations. Now, museums located across the nation can request the same pieces of space history that U.S. schools and universities have received since the end of the space agency's shuttle program in 2011. For 30 years, NASA stocked its shuttle pantry with shrimp cocktail and spaghetti with meat sauce, among a variety of other dishes. Dessert selections on the shuttle included freeze-dried strawberries and off-the-shelf sweets such as candy-coated chocolates (otherwise known as M&Ms). To drink, crew members could choose from coffee or tea, as well as powdered juices (Tang, in its many flavors). That said, the food being offered is for demonstration and display use only. "Not for consumption," NASA warned on its website. The other artifacts NASA is offering, lightweight thermal tiles, protected the shuttle orbiters from the extreme heat encountered during re-entry into Earth's atmosphere. An example of one the more than 20,000 heat shield tiles used to protect the space shuttle while entering the atmosphere. More than 20,000 tiles were installed on each shuttle and each tile was designed to survive 100 trips to space and back. Varying in thickness from 1 inch (2.54 centimeters) to 5 inches (12.7 cm), the tiles shielded the orbiter against temperatures as high as 2,300 degrees Fahrenheit. Both the space food and the tiles are available to eligible institutions on a first-come, first-served basis. Museums and schools must have the proper credentials from their state or federal agencies to qualify. The tiles are available in three types: black coated, white coated and uncoated. Institutions may request up to three tiles, one of each type, while supplies last. The tiles are free but the schools and museums are responsible for the shipping and handling fees, $23.40 per tile. 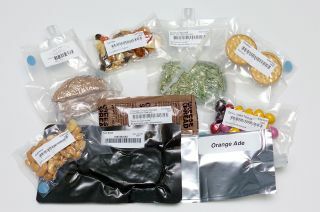 The space food is offered as a package of approximately three space food items for a shipping and handling fee of $28.03. Eligible institutions may request only one set of the astronaut meal items. NASA, together with the General Services Administration (GSA), is also conducting its 14th round of space artifact screenings. Since the end of the shuttle program, NASA has made available thousands of other space artifacts for museums, including the Smithsonian. The current selection of artifacts up for grabs includes early prototype space shuttle models and various components from the winged spacecraft. The space shuttle program came to an end on Aug. 31, 2011, just over a month after its 135th and final mission landed on Earth. NASA earlier awarded its shuttle orbiters Discovery, Endeavour and Atlantis to museums while still retaining some of their components for possible use with spacecraft intended to send astronauts to an asteroid and ultimately to Mars. For more information or to request tiles and/or space food, see NASA's Historic Artifacts Prescreening website.